The farmland at Arnside Tower must be among the most scenic in the country. Stretching from the salt marshes of the Kent estuary near Sandside to the dip at Far Arnside, overlooking the Irish Sea, and including the slopes of Arnside Knott – the views of and from the farm are stunning. 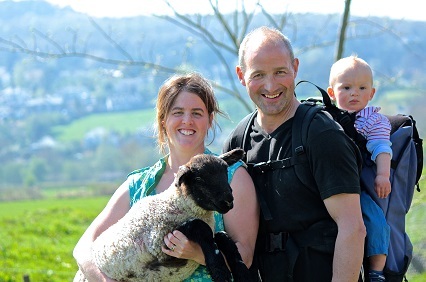 Johnny and Emmie Bland are the farmers; Johnny’s family have been tenants at Arnside Tower farm since his Dad moved there in 1956 at the age of 18. The farm itself is part of the Dallam Tower estate. Conservation forms a central part of farm life: 56 acres of the land are in higher level stewardship – a scheme run by DEFRA to support farmers in high priority areas to carry out demanding, advisor-led habitat management and deliver significant environmental benefits.16 acres of Arnside Tower Farm are in HLS for breeding birds (mainly lapwings), and 40 acres are in HLS for winter waders, including geese. 120 acres of the land are coastal marshland. Some is low input limestone grassland. 66 acres of the land, on Arnside Knott, is home to protected orchids, and this land is grazed with Highland cattle. Additionally, Johnny and Emmie received 120 trees as wedding gifts and planted the new oak, alder, willow, beech and various fruit trees around the farmland. The water for cleaning the farm, and for the house, is heated using a biomass boiler. Animal welfare is also a fundamental part of their philosophy, especially as Emmie is also a vet. The Blands have sheep and cattle herds, and also raise pigs and hens on the farm, with the eggs and pork mainly for the family’s use, due to the importance they place on traceability and animal welfare. Their cattle are currently Holstein-Friesians, although later this year they will be crossing them with Jersey cows to produce higher protein milk. Many people assume that milk is all free range, from cows free to roam in fields. Often this is not the case, with animals being kept indoors and fed on silage. However, the cows at Arnside Tower Farm are small and hardy and can be outside in the fields from February to November every year – the limestone farmland is very dry and free-draining, which means it doesn’t get boggy underfoot, allowing almost year-round grazing. The cows are moved each day to fresh paddocks to give the grass chance to regrow and give the cows the nutrition they need – each paddock being grazed once every three weeks. The Blands currently sell their milk through Arla and a co-operative but hope to sell unpasteurised milk locally in the near future. 120 acres of the farmland is salt marsh, where the Blands graze their sheep. As well as providing a more tender meat than mountain lamb, it’s also a more organic option since the grass is salt-washed, which prevents parasites and liver fluke from living on the grass, significantly reducing the need for medications. During the summer months, you can enjoy a visit to the farm in the ‘Tower Teas’ tearoom. Fresh baked cakes every day, tea, coffee and soft drinks. Open 10am – 4pm.